My wife and I returned from two weeks in Malawi on 10/1/18. Our group of eight traveled throughout the country visiting various sites and projects undertaken by the Malawi Project. This was my second trip to Africa but just my first to Malawi. This was one of the most emotional series of events in my life. To see first hand the need of the nation while at the same time witnessing first hand the success of so many projects from educational to medical to agricultural, was at times overwhelming. The things I found so gripping in America tumbled away day by day when I saw the great need in Malawi. However, it was, and remains, so inspiring and uplifting to have seen the numerous individuals and other non-profits that have blessed these humble people by allowing the Malawi Project to guide their donations, (physical and monetary), to the right places. Returning home has been emotional. I’m viewing the world as a brighter, more hopeful place. There is so much more good than bad, more love than hate, and certainly more hope than despair. It’s hard not to smile remembering the amazing singing of celebration in one of the villages as they officially opened their first grain storage building. The Malawi Project, meaning -the donors- provided a very small amount of money for the concrete floor and the roof, but the structure was constructed by the local villagers including making the bricks. They have already designed the method to store excess grain and an accounting method that will feed not only the family members of those that stored the grain but those that physically cannot care for themselves when the next famine occurs. Jim Messenger is pictured with his wife Rae Ann, during their recent trip to Malawi. 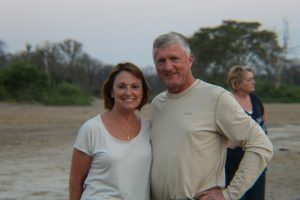 Jim’s comments also appear on the website https://greatnonprofits.org/org/malawi-project-inc We invite you to visit the site and post your own recommendations concerning the work of the Malawi Project.